Architect and co-director of BBM sustainable design practice, creating innovative architecture. Duncan will introduce the day including an overview of The Waste House, an A+ rated house built in 6 days and featured on Grand Designs. A trip to the house currently being reconstructed on site will take place in the afternoon break. Architect and author of The Green Self-build Book: How to Design and Build Your Own Eco-home; designing custom built, award wining, low-energy homes. Jon has been designing cutting edge eco homes for over 30 years. Jon will outline the position of resident control from the outset of mass housing in Britain in the late 18th century; he will describe the birth of building societies, plotland development, growth of self-build in the late 20th century, and the role of ‘Grand Designs’ for those with land and money. He will discuss recent interest in co-operative, shared ownership and co-ownership models, looking at comparisons with experience in Europe and elsewhere. He will focus on the significance of control over housing and its relevance today as a necessary feature of properly sustainable neighbourhoods. 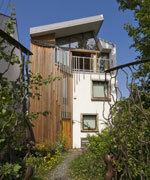 The Tree House, in Clapham, South London, was built to an ambitious ecological specification. Inspired by the tree at the front of the site, the house is highly adapted to the local climate, built of sustainable materials and gets all its energy from the sun. Completed in 2006, it was an early example of a ‘zero carbon’ home. Its owner, Will Anderson, is now planning to build another house next door. This time, he is pushing his ecological specification one step further to create a home that is edible. Low-impact round house builder and author of Building a Low Impact Round House, Tony built his own eco-home in Wales and successfully won a 10 year planning battle for this roundhouse. Tony will share a 15-minute film then join us for questions via Skype. In his talk, he will speak about his own roundhouse made of roundwood skeleton, cordwood walls and turf roof, which he designed and built with his partner Faith fifteen years ago at a total cost of £3,000. It is off-grid and now has planning permission as a Low Impact Development. Tony leads courses on building similar simple wooden structures. This talk will show you some pictures, give some tips on what Tony has learned, and maybe encourage you to give it a try. Director of Ecotecture architectural practice since 2005, and dedicated to promoting green issues at every opportunity, Jake is a keen member of the AECB and regularly contributes to the Mid Sussex Design Panel. 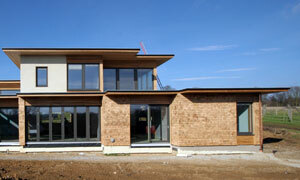 Jake White will be speaking about the Curly House, a near Passivhaus dwelling on the South Downs Way. The talk will cover the planning process, a brief explanation of how the design relates to the Passivhaus standard and how the complex design of the Curly House improves rather than reduces the dwellings’ efficiency. Jake will open the debate about how a dwelling which uses petrochemical products and concrete considers itself to be called green architecture, exploring how the Curly House demonstrates the difference between green architecture and the architecture of resilience. Daren is an Ecologist and owner builder with a long standing interest in human shelter and how through our homes we can better align with our living earth. He built his first structures as a child in the woods of the Pennines, has lived in many indigenous shelters in Africa and Asia and decided to pursue a search for the best ecological building forms in the mid 90’s – culminating in the launch of Earthship projects in firstly Brighton, then Brittany – a story closely followed by Kevin McCloud for Grand Designs. Daren will talk and present on his views on shelter, the lessons he has learnt from building the Brighton Earthship, and the more advanced Brittany Groundhouse. He will explain how it was done and will include an update on Earthship developments globally. He will describe the newly re-launched website dedicated to The Exploration of Shelter, which includes details of his book co authored with Adrianne Nortje which covers the basics of self building and building an earthship, as well as the community side of self building. One of the UK’s foremost straw bale construction experts, Bee has been building with straw bale for over a decade previously with the famous straw bale building co-operative Amazonails, and now with Strawbuild. She has taught straw bale construction, and is known for her wonderful ability to lead inclusive and inspiring workshops. Bee will talk about how working with natural materials – straw, clay, lime, stone and timber in the creation of energy efficient, low impact, environmentally sensitive buildings, with like minded people can be incredibly positive and empowering. She will explore how strawbale buildings with good passive design offer ready climate change mitigation, are better than carbon neutral, are biodegradable yet highly durable and offer healthy living spaces, and offer an unusually fun and accessible build experience for individuals and community groups. The speakers will discuss the key themes raised during the conference and answer questions from the audience.